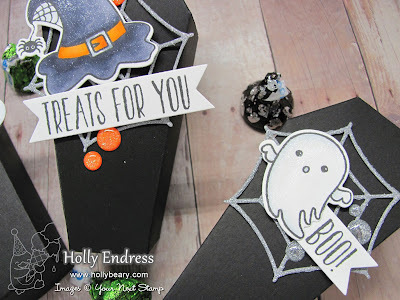 Hollybeary Creations : Too Cute to Spook!! It's time for our Designer Showcase at Your Next Stamp. This month it's all about Halloween Party Projects. The Design Team are creating lots of fun projects for all your Halloween Party needs. I created some fun party favor boxes with the Fab-Boo-lous stamp set and coordinating dies and some Coffin boxes I found at the Target Dollar Spot. 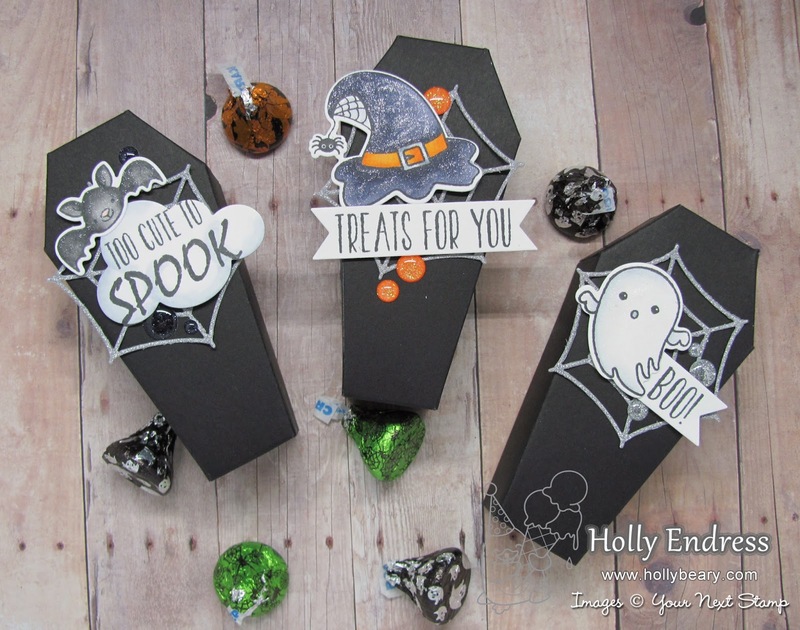 I assembled each box and filled them with some Hershey Kisses and then I decorated each box using the images from Fab-Boo-lous and the Spider web die from the Happy Hauntings Die set. I stamped the images and colored them with Copics and then I cut them out with the coordinating die cuts. I adhered them over the Spider web on each box with some foam adhesive. Then I stamped the sentiments onto some White card stock using Black Olive Ink and die cut banner shapes with the Fishtail/ Banner one die set. For an extra pop of sparkle I added some Sparkly gumdrops in Give Thanks to Sparkle, Licorice & Tinsel. The sentiment with the Bat image is stamped onto a Puffy cloud from the Puffy Cloud die set. Head over to the YNS blog for more great inspiration and be sure to stop by each day this week for more projects.